The triumphant moment when Eric Zeigler and Amy Fabbrini bring their baby home after almost a year in foster care. Photo source . In a dramatic turn of events, an Oregon judge has ruled that the children of Amy Fabbrini and Eric Zeigler must be returned home. They were taken by Child Protective Services on the grounds that their parents’ IQ was too low to parent. There was no abuse. No neglect. There were only allegations by social workers that they were not clever enough to be parents of their own children. The boys, ages 4 and 10 months, were each seized within days of their births. The state had every intention of terminating their parents’ parental rights and adopting them out. 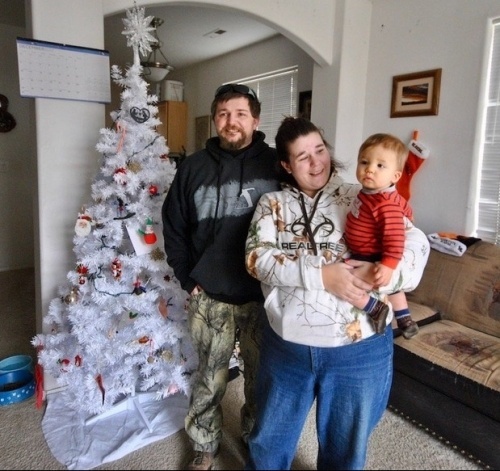 The couple found a tenacious voice in Sherrene Hagenbach, a doctoral student who volunteered with the Oregon Department of Human Services (DHS) Child Protective Services (CPS). 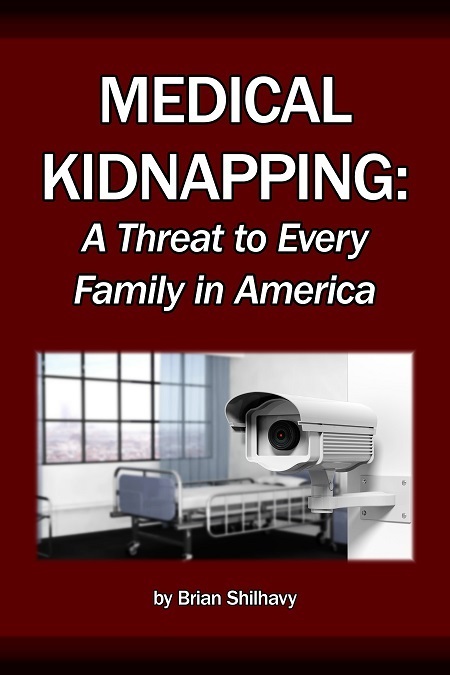 Her role was to monitor parental visits with their children in CPS custody. That is where she met Eric and Amy. Sherrene Hagenbach, a Professional Mediator and Life Coach, was horrified by the way that the system treated their family, and she began tirelessly reaching out to media to get their story out. Sherrene Hagenbach has worked tirelessly to see justice for this family. One person CAN make a difference! Photo source . I’m grateful for your help. I felt smaller than David in the childhood story of “David and Goliath.” You [at Health Impact News] writing the story helped me throw my first stone. The public was rightfully outraged that the state had such unrestrained power, and word of their story spread into the mainstream press. Since that time, their story has picked up by The Oregonian, Glenn Beck, The Daily Mail UK and others. Social workers argued that the couple’s IQ rendered them incapable of caring for the children that they brought into the world. Eric Zeigler and Amy Fabbrini both graduated from public high school in the middle of their class, and each received standard diplomas. Nonetheless, the state pointed to perceived inadequacies to parent that occurred during their twice weekly visits with their sons. The family faced 11 days of trial in December over custody of their children, and another 3 days in January over their older son, during which the state paraded witnesses criticizing Eric and Amy’s ability to take care of Hunter and Christopher. Among the reasons stated as support for the state’s removal of their children were not reading to them, failing to put sunscreen on them, and providing fried chicken nuggets as a snack for a toddler, as opposed to healthier food. Hunter, who was born in February 2017, was taken from his parents at 2 days old. His brother Christopher, now 4, was taken at 5 days old. These parents have only seen their children 2 times per week since they were born. They wanted to make their visits count. She says that they DID read to them, but during their limited time, they did other things that their children wanted to do. More often, they wanted to play, not be read to. If the boys didn’t love being read to, wouldn’t that be more a reflection on the foster parents who have had them since birth and spent the most time with them, and not on the biological parents? Sunscreen is something that some well-educated parents opt out of in view of the toxins in them . The use of sunscreen in normal circumstances is not a reflection of ones ability to parent. When they brought snacks for their children, Hagenbach explains, they wanted to bring snacks that their boys liked. Like millions of American children, the Zeigler boys like chicken nuggets. Their parents made the decision to try to make their visits be a positive experience for their children. They didn’t want to battle over food. I will affectionately remember this case as the “chicken nugget case.” I found it difficult to read that these parents tried this thing and tried that thing and then they are advised that instead of chicken nuggets they should have boiled chicken breast, that giving fried foods is a parenting deficiency. That was hard to read. “We are looking at a totality,” said Karen Stanley, attorney for the Department of Human Services. 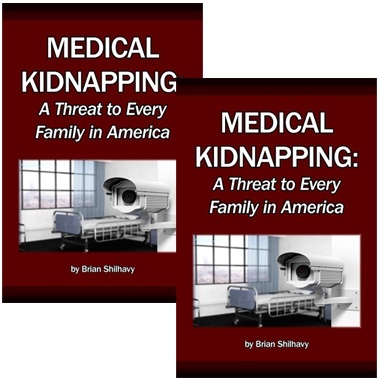 At one point Stanley argued the couple’s housing permanency – they live in a house with the mortgage paid by Ziegler’s parents – was a sign of deficiency. “Going through the rental and purchasing processes show a level of functioning and a level of ability that would be important to look at,” she said. It seems that only in cases where parents are battling the state for custody of their children is assistance from grandparents or other family members viewed as a bad thing. In normal family situations without the state involved, parents are free to assist or not assist their adult children as they see fit. really fishing for the negatives. There were plenty of positives that they overlooked. They had to struggle to find the negatives. After 11 days of hearings, Judge Flint ruled on the Thursday before Christmas that 10 month old Hunter be returned home the next day. That case is now closed. Hunter has been in foster care since he was 2 days old. His parents are overjoyed to have him finally home. 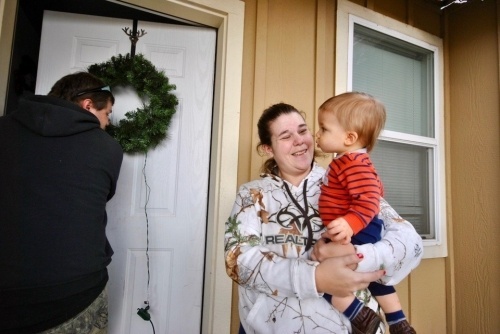 Baby Hunter was home in time for Christmas after being seized from his parents at 2 days old. Photo source . I feel the threat articulated to Hunter is fairly amorphous. I searched and searched for some sort of language that was provided to articulate what the current threat of harm is to Hunter right now. … There is no allegation that they’re not able to meet his basic needs. The trial over custody of Hunter’s older brother Christopher took place on January 9 through 11. On Thursday, Judge Flint ruled that Christopher is to be returned home. The DHS request to terminate parental rights was denied. Unsupervised visitation began the next day. A review hearing will be held in two weeks. 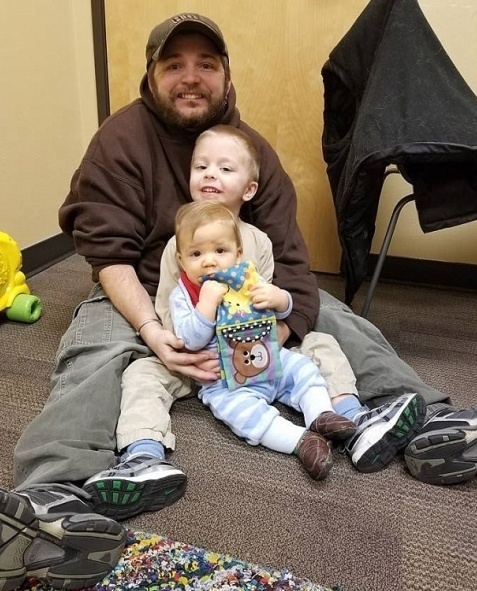 Until then, the parents can have unsupervised visits with Christopher while the state puts in place a plan to gradually reunite Christopher with Fabbrini and Ziegler without abruptly taking the child from his foster parents, whom he’s lived with since days after his birth. The foster parents who have had him from his earliest days reportedly were “fostering to adopt” and have expected that they would be able to adopt him. Eric Zeigler will soon have both of his sons home. Photo source – The Amy and Eric Story: #returnchrisandhunter to Their Parents Facebook page. Social workers reportedly want to see improvement in his social skills and for him to be able to focus longer on things. When children are separated from their parents, no matter what age, there is trauma. The baby has spent the entire 9 months of gestation growing and developing with the expectation of meeting the mother whose voice was the first he heard in the womb. According to experts in prenatal and perinatal psychology , they cannot comprehend being placed in the arms of another, and they grieve the loss of their biological parents when they are not there, for whatever reason. One has to ask how much of Christopher’s issues are related to him being taken from his parents. There is no question that the impact is profound. Though social workers have expressed alleged concerns about him, Hagenbach says that he has not actually been diagnosed with any disorders or conditions. 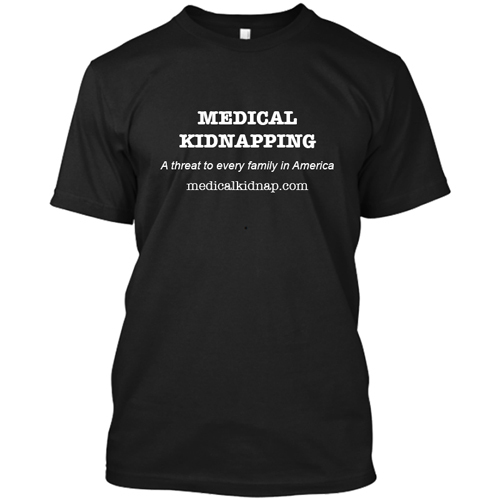 Support the cause of MedicalKidnap.com , which is part of the Health Impact News network .